Students electing to study at Montana educational institutions, as resident or out-of-state attendees, have a wide variety of postsecondary options available. The Montana University System is comprised of sixteen two- and four-year colleges and universities, while Montana State University also offers six campuses throughout the state. More than 70,000 students are enrolled in these two divisions, in addition to students attending one of the state's three private institutions. Prospective students researching their options at the associate and bachelor's levels will find the following data-driven guide helpful when planning their educational path. 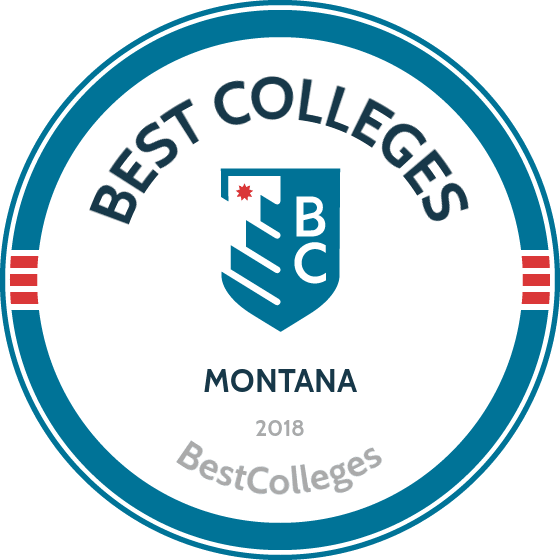 We have applied our rigorous methodology to the latest education data to rank the best colleges in Montana, including the top four-year and two-year schools. Approximately 87% of university students in Montana elect to attend one of the state's 11 four-year institutions. Options range from research institutions such as the University of Montana to Carroll College, a private institution associated with the Roman Catholic Church. There are also a number of tribal colleges scattered across the state offering bachelor's degrees. Students attending four-year institutions in the state graduate with nearly $6,000 less in student loan debt than the national average; every 6.6 out of 10 students will have accrued student debt upon graduation. Celebrating its 125th anniversary next year, Montana State University is the largest research college in the state. MSU emphasizes undergraduate research and creative projects, and is located in Bozeman, one of the nation’s top college towns. Situated 90 miles from Yellowstone National Park, the university takes pride in its unique connection to the great outdoors. Rewarding undergraduate degree paths at MSU include microbiology, pursued by famous scientist Maurice Hilleman, and film, from which Hollywood director John Dahl graduated. In total, MSU offers over 225 academic options in eight colleges, including the College of Letters and Science, distinct for winning competitive national grants for research. These also include specialized programs, such as pre-law, pre-medicine, and military aerospace studies. As well as its on-campus curriculum, MSU emphasizes community service and study abroad programs, in which students can study over 250 programs in more than 60 countries. Carroll College is a private Roman Catholic liberal arts institution located in Helena, the state’s capital. In part due to its active participation in federal initiatives, CC is one of the best colleges in Montana for veterans. The school has an undergraduate enrollment of nearly 1,500 and students partake in a diverse selection of majors and minors. All students are able to participate in groundbreaking research through not only state-of-the-art facilities but also via grants from government agencies, such as the U.S. Centers for Disease Control. CC students achieve notable success in the school's pre-med program: 85% of students are accepted to medical school and 100% of chemistry majors are accepted to graduate school. CC's forensic team, the Talking Saints, has won or shared the Northwest Conference Championship for 26 consecutive years. CC’s football program is one of the most successful in the National Association of Intercollegiate Athletics and has to date won six national titles. Grounded in the traditional beliefs of the Flathead Nation, Salish Kootenai College’s mission is to provide access to higher education for Native Americans throughout the United States. Located in Pablo, Montana, Salish Kootenai serves the Bitterroot Salish, Kootenai, and Pend d’Oreilles tribes. Twenty-eight percent of the student population consists of non-Native American students. The average enrollment per course is 10 students, making the school's student-to-faculty ratio one of the lowest among colleges in Montana. The school offers 14 bachelor’s programs taught by industry experts and 84% of faculty members have master’s or doctoral degrees. After completing orientation, undergraduates take part in two online, research-based programs offered by the Center for Prevention & Wellness. Beyond these programs, students can study for bachelor of science or bachelor of arts degrees in subjects ranging from hydrology to tribal governance to information technology. Montana Tech, originally the Montana State School of Mines, is a public university now affiliated with the University of Montana. The school is one of the best colleges in Montana for student success, boasting a 97% job placement rate after graduation. Montana Tech offers more than 60 degree programs, including a new BS in data science, one of the country’s fastest-growing careers. The school's largest department is General Engineering, where students pursue advanced research studies. Graduates from the department are in high demand in the industry. Other colleges within the institution include Highlands College, which is largely focused on technology, and the Montana Bureau of Mines and Geology, which is the state’s main source of earth science information. In addition to academics, Montana Tech fosters many opportunities to explore its “outdoor classroom.” Students are encouraged to get involved in an array of recreational, academic, religious, political, and professional clubs and organizations. Situated in Butte, the campus is notably close to spectacular outdoor adventure spots. The University of Montana Western is located on a 26-acre campus in Dillon, one of the most scenic areas of the United States. Montana Western is the only college in Montana--and the only public college in the country--to offer Experience One, an innovative program that allows students to take one course at a time, three hours each day for 18 days. This concentrated, experiential learning rewards the same amount of credit as traditional multiple class systems, and students benefit from close relationships with faculty. Undergraduates can choose from specially-designed block classes in ten departments. These include the school's business and technology program, the first program to receive accreditation through the International Assembly for Collegiate Business Education; the department of education, the oldest in Montana; and the equine studies department, which offers the nation’s only four-year degree in national horsemanship. All students can partake in formal research and internship opportunities to explore how professionals work in the real world. Rocky Mountain College is a comprehensive liberal arts college located in a suburban neighborhood of Billings, Montana’s largest city. The school is affiliated with the United Church of Christ, the United Methodist Church, and the Presbyterian Church. The 52 undergraduate majors offered at RMC includes one of the best aviation programs among colleges in Montana and the nation as a whole, as well as other distinct offerings, such as equestrian studies. These are taught by faculty who lead distinguished programs, which currently involve an experiment aboard the International Space Station and the country’s first unmanned aircraft certification. RMC students are encouraged to develop hands-on experience; RMC holds regular field trips that range from wildlife photography to geological surveys, and 90% of students contribute to local hospitals, businesses, and nonprofits. Students are also actively involved in athletics, with 41% of the school's athletes competing in regional and national championships. Among other Montana colleges, UM offers one of the widest assortments of undergraduate degree programs to choose from, within 11 academic units such as the W.A. Franke College of Forestry and Conservation and the Davidson Honors College. Most of these programs include several options or specializations. For example, anthropology students can select from five options: archaeology, cultural and ethnic diversity, forensic anthropology, linguistics, and medical anthropology. Located in Havre, Montana State University-Northern is another unit of the Montana State University System. The school emphasizes both liberal arts and technology education. Disciplines include business, nursing, engineering and mechanical technology, humanities, natural sciences, and teacher education. The school offers over 40 majors. MSU-Northern's most popular undergraduate degree programs include elementary education, business, nursing, and diesel technology. In addition, MSU-Northern's extended university offers specialized programs such as summer sessions, a traffic education minor, dual enrollment for high school students, and Desire2Learn online classes. On campus, students have access to a variety of inclusive campus services and resources. Activities and clubs are organized by the Student Senate. These include the Sweetgrass Society, which helps Native American students adjust to college; SkillsUSA, which develops leadership skills; and KNMC, a student-run radio station. The school's athletics department’s most recent achievement was a regional championship title in wrestling. The University of Great Falls provides a liberal arts education in a Roman Catholic context. The university is located in Great Falls, Montana, an area rich in recreational opportunities near Yellowstone and Glacier National Park. UGF's current student population is 1,074--96% of which received financial aid--with a 12:1 student to faculty ratio. UGF’s 40 undergraduate degrees are based on curricula that emphasizes international studies. Popular programs include criminal justice and human services. One of the school's more unusual offerings includes its bachelor of science degree in legal and paralegal studies, available online to Army Paralegals. UGS also offers special interest programs such as music, speech and debate, and performing arts. UGF has produced some of the most distinguished alumni of Montana colleges, including Jon Tester, United States Senator, and Paul G. Hatfield, former Chief Justice of the Montana Supreme Court. Founded in 1927, Montana State University-Billings offers 28 bachelor’s degrees in four colleges--arts and sciences, business, allied health, and education--as well as two-year programs at the City College. The university also offers the broadest range of online classes among Montana colleges. Courses are taught by faculty who are leaders in their respective fields, and three science department faculty members have even received patents. Unique bachelor’s degree paths include broad field science--which provides a comprehensive foundation in general science and technology--environmental studies, psychiatric rehabilitation, and outdoor adventure leadership. High School Connections, MSUB’s dual enrollment program, allows prospective students to take classes while at high school and simultaneously earn college credits. Two-thirds of MSUB's students continue to live and work in Montana upon graduation and current students can network with over 12,000 alumni. MSUB is also supported by the surrounding community through internships, scholarships, and civic engagement. The "Treasure State" is home to 10 public community colleges, 7 of which are part of MUS and MSU systems. Just over 9,000 students are currently enrolled in these institutions, paying an average annual tuition of $3,863 as an in-state attendee. Given the national average for attending a public community college is $3,347 per academic year, students in Montana pay a comparable amount to students attending two-year schools in other states. The MUS system also has plans to expand their two-year college offerings in the coming years, leading to even more options for students seeking associate degree programs. Aaniiih Nakoda College is located on the Fort Belknap Indian Reservation, shared by the Aaniinen and Nakoda tribes. The college is open to residents of the reservation and nearby communities. Previously Fort Belknap College until 2011, the college offers academic programs that include certificate programs and associate of arts, associate of science, and associate of applied science degrees. All degree students are required to take an American Indian History and an Aaniiih/Nakoda language course. Students with a deeper interest may pursue an associate of arts in American Indian studies. At ANC, staff and student activities incorporate native culture and promote cultural identity. In cooperation with Montana State University-Billings, the Montana community college created the Nee-tha-hatsa-nak/Wa-Uspa-Wicakiya Preparation Program. The program provides grants to 20 American Indian pre-service teachers interested in earning a Bachelor’s degree in education, with the expectation that these students will eventually teach at a school where Native American students are enrolled. Established to provide educational opportunities to residents of the Northern Cheyenne Reservation and nearby areas, Chief Dull Knife College has grown from training students for mining jobs near the reservation to granting associate of arts, associate of science, and associate of applied science degrees, as well as a certificate program. Students are required to take six credits in Cheyenne studies, including at least one Cheyenne language course. At this two-year college in Montana, students can participate in activities that include intramural sports and dances, an Indian Club, and an American Indian Business Leaders Club. Dr. John Woodenlegs Memorial Library serves the school as well as the Northern Cheyenne Community, and features a special collection devoted to Northern Cheyenne and Native American materials. Members of the college community have special, off-campus access to journals and databases, as well as to the library’s laptop loan program. Blackfeet Community College is one of seven tribal community colleges in Montana. BCC's mission focuses on access, achievement, meaningful employment, basic skills, continuing education, and the integration of Blackfeet culture and language. One of many academic and certificate degrees offered by the school, its associate of science in registered nursing program began in 2015 after the school graduated its first licensed practical nursing students in spring 2014. BCC nursing students enjoy access to a simulation lab and some nursing courses are also offered online. Both fully online and hybrid distance education courses are offered in a variety of subjects (though additional fees may be required). The school offers a particular scholarship to first-time, first-year freshmen. This scholarship provides a one-time tuition waiver to students who graduate from high school the same year they begin their first year of college. Students struggling with math, English, reading, natural and social sciences, or study skills enjoy free professional and peer tutoring provided at the school's learning center. Located in Glendive, Montana, beside the famed Yellowstone River, Dawson Community College serves approximately 335 students. The school offers transfer-friendly associate of arts and associate of science degree programs, which are also available online. To earn one of these degrees, students must complete 60 credits, including 34 general education core requirements and at least nine additional credits in either the arts or science disciplines. Associate of applied science degrees and certificates are also offered at the college, and five of these degrees are offered online. Online transfer course equivalency guides can be used by students attending Montana community colleges to determine transfer credits to four-year institutions, and Dawson has articulation agreements for 13 of its programs. In addition to excellent programs and services, Dawson Community College offers a truly collegiate experience. The students enjoy numerous co-curricular activities in student government, intercollegiate athletics, theater and music productions, community service projects, intramural sports, and student organizations. The Housing and Residence Life program provides safe and affordable apartment-style housing that can accommodate 140 full-time students, and it facilitates a fun, academically oriented, atmosphere. Athletics include five intercollegiate sports: baseball, softball, men’s and women’s basketball, and rodeo. The Chippewa Cree Tribe oversees Stone Child College, which is located in Box Elder. The college offers associate degrees in early childhood education, health and physical education, health promotion, and liberal arts. Stone Child, one of the top community colleges in Montana for indigenous studies, offers an AA in Native American Studies that can be transferred to a four-year institution. It immerses students in the study of natural and social sciences and Chippewa and Cree history, language, and culture. The AA in general studies, with a natural resources option, offers two degree concentrations: geospatial technology and water quality. The geospatial technology concentration prepares learners for careers in tribal natural resource programs or to transfer to four-year colleges. Those pursuing the water quality path prepare for conservation careers in areas such as water quality management, fish and wildlife management, and soil or range conservation. The associate in science degree allows students to study allied health, business, and computers science. One of the best community colleges in Montana, Miles Community College offers several certificates and degrees, including the associate of arts, associate of science, associate of science in nursing, and associate of applied science. The associate of science in nursing degree is five semesters in length and prepares students for the licensure exam. Though the college has an open door admissions policy for most programs, only 38 spots are available in the nursing program each year, and nursing students are required to complete 255 clinical hours. Student activities include campus ministry, an ag club, an honor society, and an athletics program that includes baseball, volleyball, basketball, golf, and rodeo. All student athletes as well as students between the ages of 18-21 who have earned less than 30 credits are required to live in one of the two available residence halls (with some exceptions). Agriculture is the number one industry in eastern Montana and an Ag Advancement Center is currently under construction to support the school's agriculture and equine studies programs. Miles Community College is accredited by NWCCU, ACEN, and NAACLS. Little Big Horn College (LBHC), chartered by the Crow Tribe of Indians, enrolls approximately 300 students per term. The degrees and certificates offered reflect the opportunities and needs of the Crow Indian Reservation and surrounding areas, and most of the students enrolled are members of the Crow Tribe of Indians. Its associate of arts degree in liberal arts transfers to the liberal studies programs at the University of Montana and Montana State University Billings. An AA in directed individualized studies is also an option for students, wherein students can work with a faculty advisor to create their own major. One of the community colleges in Montana with an open admissions policy, LBHC also operates a transfer policy that allows students to transfer in the maximum number of credits previously earned. The school offers men’s and women’s basketball teams, and a new Health and Wellness Center supports both students and the Crow community. LBHC is located in the town of Crow Agency in south central Montana. Fort Peck Reservation is home to the Assiniboine and Sioux Tribes, who chartered Fort Peck Community College with the main purpose of serving the population of the reservation. FPCC offers three associate degrees as well as one-year certificate programs. In order to graduate, students must complete an approved, non-credit service learning experience totaling 30 hours for certificate students, or 60 hours for degree students. The Native American Studies department offers Nakona/Dakota language classes daily, as well as language learning for all ages. A new library opened in 2012, which offers free access to subscription databases and serves both FPCC students and the local community. One of the two-year colleges in Montana that offers men’s and women’s basketball teams, the school has on-campus housing, a bookstore and gift shop, and wellness centers at both its main campus in Poplar and its satellite campus in Wolf Point. Located in the Rocky Mountains near Glacier National Park, Flathead Valley Community College is celebrating their 50th anniversary this year. FVCC now operates two campuses with the same academic program offerings: the original FVCC campus in Kalispell and the Lincoln County Campus in Libby, Montana. One of the best community colleges in Montana, FVCC offers 100 different academic programs as well as online courses and several study abroad options per year. FVCC is home to the top Logger Sports team in the country, boasting a total of 14 national championships. Logger Sports recognize the history of forestry and logging through different competitive events. The school hosts the annual competition and competes with universities and community colleges in the Northwestern United States and Western Canada, and all students at FVCC are eligible to join the team. Other activities at the school include intramural sports, student organizations, and student government. Located in the state capital of Helena, Helena College University of Montana offers over 30 degrees and certificates. Helena is among community colleges in Montana that offers several articulation agreements, including one for its associate of science in pre-pharmacy, which completes the prerequisite requirements for the UM-Missoula Skaggs School of Pharmacy. Additionally, successful completion of the school's associate of science in elementary education allows for junior standing at the University of Montana, where a bachelor’s degree can be completed with online coursework. Students accepted into the Helena College Honors Pathway can transfer their coursework and graduate from UM-Davidson Honors College. The school has an enrollment of around 1,400 students and an average class size of 15. HCUM's student support center provides tutoring, academic advising, and career services. Career services include job listings and employment resources, assistance with resume writing, and career assessment. If you're thinking about applying to one of the best colleges in Montana, continuing reading to learn more about living in the Treasure State. Although Montana is the fourth largest state in terms of landmass, it ranks 44th in overall population. While there are a number of larger cities, the state is overwhelmingly rural, and therefore attracts many students looking to study a range of degrees devoted to understanding and working with land. The overall cost of living is 6.9% higher than the national average, although utilities and transportation are both below this number. To give students a better sense of the varied areas within the state, we've compiled a sampling of well-known regions.